Teeth are made up of all three embryonic layers. The innermost layer, the pulp, is pure tissue with blood vessels and nerves. The middle layer, dentine, is somewhat like bone, minus the actual blood, but nevertheless perfused with millions of tubules filled with a nutrient liquid and nerve extensions. 10% of this layer is made up of water, and gives the tooth its elasticity. The outermost layer, enamel, is the hardest substance in the body, and is still 4% water. 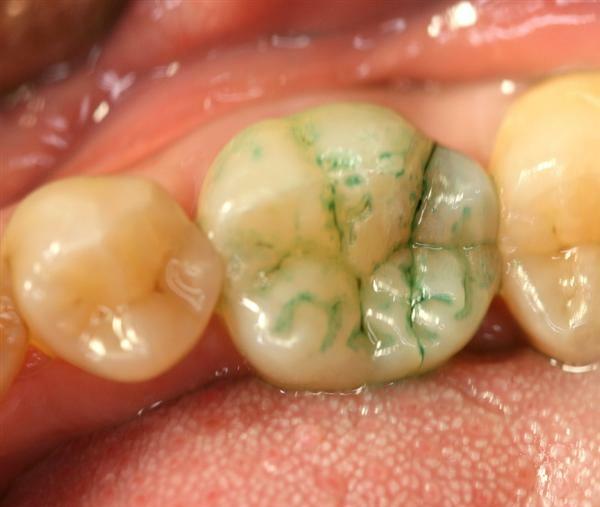 (That is what the laser “waterlase” targets when we use it to “drill” through enamel. The outermost shell, enamel, is bonded to the underlying layer of softer dentin via an interface that i consider a biological marvel. 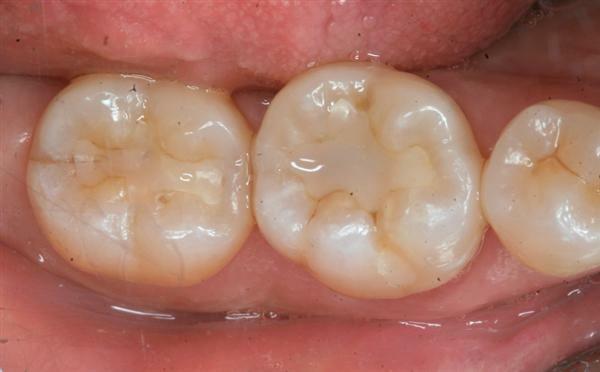 This phenomenon renders the tooth extremely durable as a unit, to an extent that its architectural design allows it to survive a whole lifetime of chewing – unless this design is violated by caries, and subsequently amalgam fillings. The tooth is then bound to crack and crumble under stress. Occasionally a severely blunt trauma to an intact tooth will cause it to chip, and rarely, to crack. Whether filled or intact, a cracked tooth that is not actually split in two will produce obscure and dull pains which are worse when one presses onto the tooth and then lets go. There may even be increased sensitivity to cold and air. This tooth is one of the rare instances where a completely intact tooth cracked under extreme chewing pressure. A green dye was used to reveal the crack. 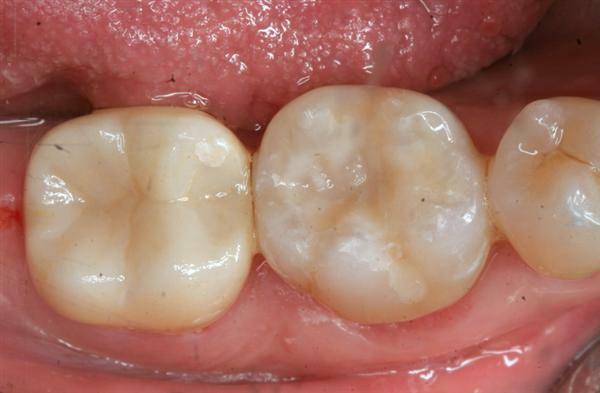 A poorly bonded composite, along with a heavy bite, had weakened this tooth, and a crack was found spanning the whole length of the tooth when the filling was removed. 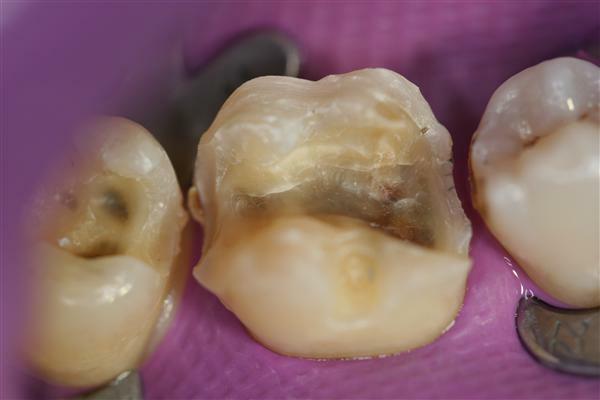 The tooth was restored with a metal-free zirconia crown strong enough to withstand the chewing pressure. This tooth had a large amalgam filling. After the filling and the decay are removed, almost always cracks are revealed, which occasionally span the whole length of the tooth. Amalgam fillings, being unstable alloy metals with different expansion and contraction characteristics, and placed into the most ridiculously unbiological cavity form designs taught by dental schools, violate the physiological architecture of teeth, which become unstable and crack under pressure. 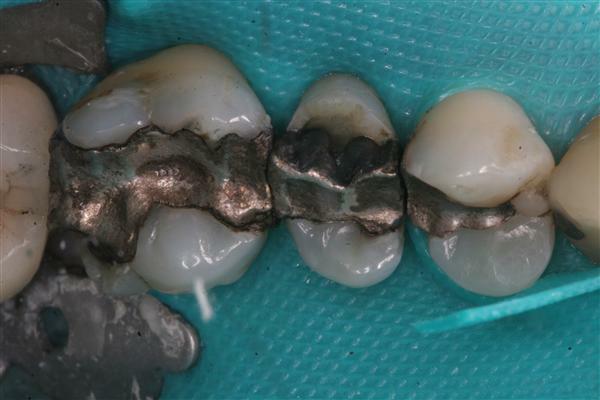 After the amalgam was removed using mercury exposure precautions, and the decay was cleaned out, full-length cracks were observed. Whether or not such teeth are lucky enough to escape a root canal, their integrity has to be reinforced with a bonded onlay or in heavy chewers, with a zirconia crown. 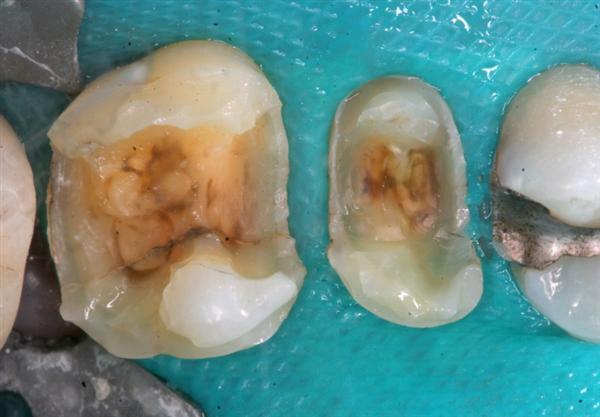 This entry was posted in Amalgam Damage, Anatomy, Education, Repair and tagged amalgam, architectural design, crack, damage, Dentin, embryonic, Enamel, pulp, repair by Admin. Bookmark the permalink.